We all champion adopting pets from a local shelter, but once a potential pet parent gets to the shelter a new problem arises — picking the animal. Most people are immediately drawn to the little ball of fluff that is a kitten or a puppy. They want to “start fresh,” but what about all the other animals in the shelter — the older dogs and cats, black dogs and the pit bull who gets such a bad rap to begin with? These animals are categorized as “less adoptable pets” and getting them out of the shelters and into homes becomes a problem for rescue groups. Just from talking about this subject with several friends last week, there is a certain perception about these types of animals – if they are older and in a shelter, there must be something wrong with them, they are “problem” dogs and cats or their upkeep is going to be more expensive. And, this is exactly why BlogPaws’ Be the Change partnered up with Petfinder to launch Adopt-a-Less-Adoptable-Pet Week Challenge – to get the word out that this is not always true. I always think about this senario: Two young twenty-somethings get married and decide to get a dog. That dog is their life. Then they decide it’s time to have kids. One of the kids starts itching… and sneezing… and itching… The kid is allergic to the dog. They try to give the dog to a relative or a friend, but can’t and decide they must give the dog up. So, next time you are in a shelter looking for a dog, take a second look at those dogs or cats who may not have immediately caught your attention. Need help finding a “less adoptable pet”? Petfinder put together a whole slideshow. 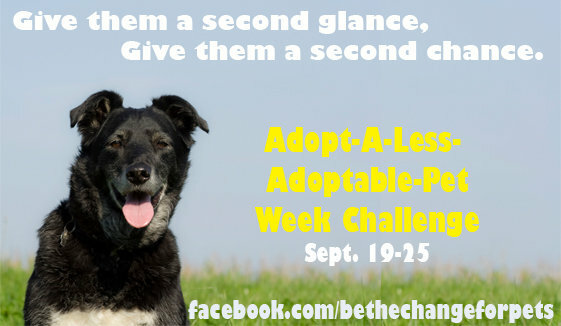 As part of the Be the Change Challenge, we were supposed to pick one of these and be a champion of them, but really, they are all so adorable. Check them all out here. I will definitely be doing this… thanks for the info. Thanks for Sharing! What a Great Idea.